Prebiotics - A dietary supplement that selectively stimulates the reproduction or activity of beneficial bacteria within your digestive system. In the passage of the upper digestive tract, most are not digested, but can be fermented by intestinal flora. It only stimulates the growth of beneficial bacteria and cannot be exploited by harmful bacteria. - Provides nutrition for a variety of probiotics in the human colon and promotes the growth of probiotics, especially Bifidobacterium. - A naturally existing substance. Present in honey, miso, Japanese rice wine, soy sauce and so on. In Asian countries, these traditional foods have centuries of edible history, which proves that IMO is nutritious and safe. - Effect is stable, not affected by temperature, pH levels and time. 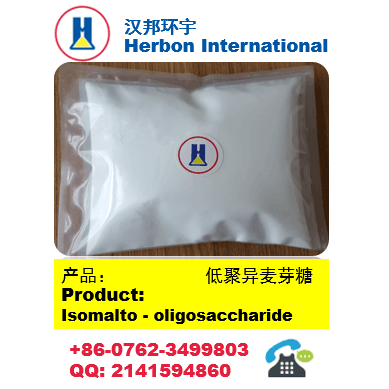 - Isomalto-oligasaccharides is also known as IMO. It is formed by the α-1, 6-glycosidic bonds between glucose molecules. - Contains >90% IMO active ingredients, high purity. - Natural raw materials, does not contain additives or preservatives, safe and reliable. - Product contain no glucose, only fructose and IMO. - Fructose content can be modified to meet customers needs. 2）Metabolic pathway is unrelated to insulin, and ingestion does not cause blood sugar and insulin levels to fluctuate. 3）Compared with glucose, fructose poses less burden on the liver and has a protective effect on the liver. 4）Natural sugars, green and safe. - Herbon Formula 3’s proliferative effect on Bifidobacterium was about 1.5 times higher than other market products, and about 1.2 times times higher than that of GOS and Inulin. Herbon Formula 3 generates 30% more short chain fatty acid compared to other IMO products in the market. Data are provided by Microbial Research Institute of Zhejiang Academy of Agricultural Sciences. - Relative to National standard, Herbon’s formulas contain less monosaccharide, and more 4 Dp and above IMO. - Herbon Formula 2&3’s IMO content >90%, which are amongst the highest in the market. - Sweetness: The level of sweetness can be modified based on client demands. Sweetness can be as low as 10% of sucrose. - Resistant to dental caries, not easily fermented by pathogens causing tooth decay.